After their lukewarm take on The A-Team , director Joe Carnahan and star Liam Neeson reunite for this more satisfying thriller. Inspired by Ian Mackenzie Jeffers’ short story Ghost Walkers , it’s Jaws below zero, as a group of plane-crash survivors battle the snowy elements and a pack of truly ravenous wolves. Neeson’s grizzled Ottway knows a thing or two about these beasts. A sharpshooter employed by to protect the crew from animal attacks, he’s the ideal leader, but even he admits to being “terrified” when his plane nose-dives in the remote Alaskan wilderness. No hope of rescue. Temperatures plummeting. And soon enough the half-dozen survivors are being stalked by wolves, having encroached on their terrain. Just like the lupine nasties, The Grey certainly marks its territory. Frank Marshall’s 1993 Andes-set Alive - the one with “that dude from Training Day ” – gets an early reference. But while this is similarly a survival story, Carnahan’s handling of the man-vs-beast element adds nerve-battering tension to an already brutal situation. As they decide to abandon the plane and head to the nearby trees for protection, the bedraggled party inevitably suffer casualties, either via the weather or the wolves (smartly rendered with a mix of CGI, animatronics and live animals). That doesn’t leave much room for characterisation – Joe Anderson’s Flannery is cocky, Frank Grillo’s Diaz is brash, Dermot Mulroney’s Talget is thoughtful… you get the idea. 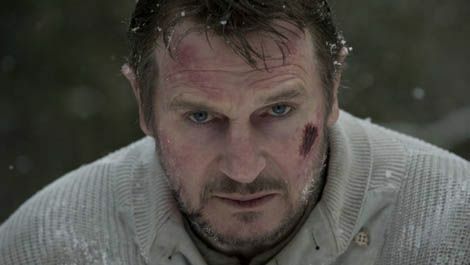 Yet in spite of its necessarily basic approach, not to mention one insane-bordering-on-ridiculous Cliffhanger -style action scene, what drives the film is a titanic performance from Neeson. Melding his Taken action persona with a more soulful study of a disenchanted man, who claims “I’ve stopped doing the world any real good”, it’s up there with his most commanding work. By the end, you’ll be rooting for him like your life depends on it.